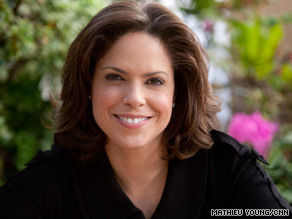 Soledad O'Brien's new book explores the Latino experience and her own in U.S.
CNN's Soledad O'Brien explores the richness of the Latino experience -- and her own -- in "Latino in America." (CNN) -- When you have a name like María de la Soledad Teresa O'Brien, you have a lot of explaining to do. My mother is black and also Latina, more specifically Cuban. She is a devout Catholic who credits the Virgin Mary with any success she's had in this country. But it was my father, a man who spoke no Spanish, who chose the name María de la Soledad to honor the Blessed Virgin Mary of Solitude ("solitude" in Spanish is soledad). The Latino population is set to nearly triple by 2050. This month, Soledad O'Brien journeys into the homes and hearts of a group destined to change the U.S. Witness the evolution of a country as Latinos change America and America changes Latinos. That is the major reason I was compelled to take my project further, to write this book and crisscross this country speaking publicly about my community. I truly believe more Latino journalists need to be talking about the future; about what will happen if this nation does not embrace the biggest cultural change of its lifetime and to educate people about it. I feel I am up to the task. If I had any unease defining who I am, reporting this story has shown me my place in this Latino community. That place is as the Latina journalist charged with telling the story of the culture my mother gave me, the culture that is changing America and being changed by America. I need to show America the beauty of my culture, the work ethic of my people and their unflagging faith. I need to introduce America to the wonderful music, food and sport our culture has brought to the American mix, just as previous immigrant groups -- the Germans, Jews or Irish -- did before Latinos. I need to be the one who explains that our American Dream is not the same as those of other immigrant groups because our journey to the United States, back and forth across the border, predates the journeys of all those immigrant groups and will obviously continue into the future regardless of what happens. Latinos have a plan, not a dream, and it is to mix the best of ourselves with the best of this country. I want to talk about a people who hold fast to familiar roots however distant they are from immigration, who believe that humility and pride can come together, that resentment and fear are a toxic mix, that you have to have a bit of fight in you to get ahead but cherish the ability to smile at yourself at the end of the day. I have never wanted to be defined by the color of my skin, my funny freckles or my mother's obvious accent. But I am happy to let it determine how I stand in the world. Latinos are already the majority minority in the United States, and their numbers are so great that they will be the future of this country even if immigration stops tomorrow. The number of Latinos who are U.S.-born now surpasses the number of immigrant Latinos. The average age is in the teens. This young population wants to identify as Latino, they want to speak the Spanish of their ancestors no matter how many generations they are removed from immigration. They are proud of who they are, just as I am. I worry about our future if the current young Latino generation feel like strangers in the land where they were born or end up resentful because they have seen their parents and their culture demonized by the people around them. I came to love who I am because I had parents who allowed their kids to prosper as individuals. I was well-educated in a community that valued difference. I have a high investment in the future. One of four children in this country is Latino, and four of them are mine. So I will tell the story of Latinos the way I know it should be told.